We climb the Grand Staircase in the St. Pancras Renaissance London Hotel and scour the myriad halls and corridors for a small meeting room. Behind the door sit Clarkson, Hammond and May: the ex-Top Gear trio best known for causing controversy and creating a motoring magazine programme that became one of the BBC’s highest-grossing and most-watched shows across the globe. As well know too well, that came to an abrupt end after a fateful argument over a cold meat platter and the likely lads have been pretty quiet ever since. The temporary hiatus is now over and Clarkson, Hammond and May are back with a bang, not only launching a new format TV show, which controversially airs on Amazon’s Subscription Video On Demand [SVOD] service, but also a new social media platform, dubbed DriveTribe, designed to give automotive fans a voice. The Grand Tour – for which Amazon reportedly paid £130m for three series and is streaming in over 200 countries – has already garnered an enormous following, despite viewers having to pay for the Prime platform. However, DriveTribe is still very much in its infancy, only officially opening to the public last month, but it is rapidly gaining users and the chaps are keen to share their vision with the world. First of all, can you tell us, in your own words, what DriveTribe is all about? Richard Hammond: It’s that hybrid element between social media and a huge resource of amazing automotive material. When we were testing DriveTribe, we realised that some of the material will be the most amazing thing you’ve ever seen and some will be more casual and throw away. So, it features the engagement of social media, as well as offering a huge resource of motoring-related content. Jeremy Clarkson: I was about to say exactly the same thing. Every time you turn on the television news, there’s something about how cars are bad, something about how cars are killing the polar bear, cars are dangerous, cars kill thousands of people a year. Then, there’s all this stuff with TFL [Transport for London] and their endless pursuit of making every road a cycle lane or a bus lane. Everybody has been told that cars are bad and they’re just not. DriveTribe is a place we can go; it’s our world away from [Jeremy] Corbyn and [London] Mayor [Sadiq] Kahn. Like James said, you are not alone. Does that mean there are lots of little niche Tribes to join? RH: Yes, once the site grows and gets to scale, you’ll find that there are lots of people out there who like to collect hubcaps, or whatever it is. That’s sort of the point. JC: A friend of mine wanted to start a Tribe for the 1981 Rabbit Coupe, because she’s American, and I thought ‘yeah’. She’ll probably only get ten followers but those ten people will be screaming, ‘someone else likes that car!’ and that’s the whole point. JM: I was at an event some years ago and somebody introduced me to a chap I will never forget, he was eccentric. He collected spark plugs. He had a caravan with a display area in it and he had them all lined up and dated. He probably felt alone before but he’s not alone now. Whose idea was DriveTribe and how did it come about? JC: I did neither of those things. When we were, ahem, all looking for something to do earlier this year, we realised that old-fashioned TV – as in scheduled linear television – wasn’t really an option. One option was to go down the SVOD route, which is what we have done. The other idea is to get out on the Internet to as many people as possible. We were toying with all of these ideas and this is the second part to come to fruition. We were all thinking the same thing, but we realised it takes a lot of money to set it all up, so we then had to look at our bank balances and plunged everything we’ve got into it. So, you went to someone with the idea? JC: Yeah, we did, but despite Hammond’s joke, we can’t write the code or fix up PR days and think of anything sensible to say on PR days. We can’t do the actual business stuff. JM: Absolutely, we’re not your men for that stuff. We can do the content and we know how to entertain. JC: We don’t know how Amazon take our TV show and make it appear on your laptop but they do. It’s the same with DriveTribe, we know what to say on the Tribes and then techies do the rest. Can you describe your individual Tribes to us? RH: We are in an unusual position to most, as we are already known for certain traits. So essentially, some of our initial tribes will be our take on the world of motoring through our eyes. JC: I think Hammond is trying to say they are ‘overarching’. But I have a specialist tribe called Alfa Male, which will be about Alfa Romeo. Because I like Alfa Romeos. No, I like what Alfa Romeos could be. But at the moment I just want it to say Error Code 404 when you log on. It will be written in beautiful script but it just won’t work. Do you think you’ll be creating more individual Tribes? Tribes that reflect your real loves? JC: James wants to do a Screwdriver Tribe and Hammond wants to do something about vintage bikes. Are we right in thinking you like your vintage bikes too, James? JM: Vintage? Second hand I think you mean. JC: I did an eight-hour flight with these two the other day, to Chicago, and they each started with an old motorcycle magazine. Four hours in they swapped. Movies: not watched. Chat: didn’t happen. New show: not discussed. RH: In all seriousness, that’s what will be exciting over the coming weeks. Watching the various Tribes sort themselves out. Watching the ones that really take off and the others fall by the wayside. JC: It’s true. There’s a lot of Porsche 911 stuff on there at the moment and I’m looking forward to the machine do its work. It calculates, algorithmically, what is most popular and I can’t wait to watch the Porsche 911 stuff disappear off the homepage. What do you predict will be the most popular content on there? 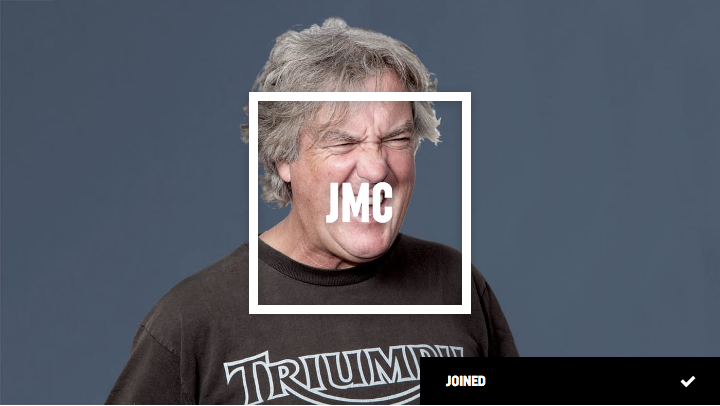 JC: … The motoring stars of the future are going to emerge on DriveTribe. That’s a given. The next ‘us’ or the next Matt LeBlanc is going to come from the site. If you garner a massive following, which can be done, people are going to sit up and take note. They’ll start demanding you appear on TV. It will be the Formula Ford of the journalist world but easier to get into. All the journalists out there will be asking if these content creators will get paid… will they? JC: I believe there’s a way to monetise everything. JM: They will eventually. Not yet, because it is starting out but they will. You haven’t always been the biggest advocators of new technology and now you are suddenly breaking ground in the digital world. Why the sudden turnaround? RH: This is about communication and this is what we specialise in and any new way that we can get new content in front of people to share, we are bound to go after it. JC: We could say we want to do this new thing and post everyone a letter, but even I’m not so much of a dunderhead to think that was a good idea. Yes, I’m not very tech-minded, I’m not very good when I sit with a piece of technology, James will be in the background saying, “give it to me”. But obviously I’m aware that if you want to reach large numbers of people these days, linear old-fashioned television is declining and this is the obvious way of doing it. JM: The weird thing is that we have spent a long time on the telly and now we’re on new platforms, but the stars on these new platforms seemingly want to get on the telly. It seems absurd, but it feels like we are in a period of chaos at the moment. Do you think it will spark a big shift in the way that people consume media? JM: I don’t think that people will necessarily ignore traditional platforms but the thing that’s great about DriveTribe is the social media element and the fact we can all spark off each other. But the platform is perfectly capable of sustaining long form, beautifully made films that occupy a lot of data. JC: (laughs) Are you sure you want to say Netflix, James? Has this opened up your eyes to other forms of emerging tech? RH: I would love to experiment with making some Virtual Reality stuff. Cars have a passenger seat and VR is perfect for giving the viewer some amazing access. JC: Yes, that’s the second thing it will be used for. I was playing around with VR the other day and I was thinking, ‘yes this is incredible, here’s a dinosaur’. But just wait until that’s one of the Kardashians. RH: But yes, the second wave of VR, after what Jeremy is talking about, will include cars, adventures and travels. It’s perfect. Do you think that one day, we could watch the Grand Tour from the passenger seat of the car you are driving? JM: There’s a slightly more complicated question in that, because the language of television, which has been the same yet has evolved over the last 70 years, would have to change dramatically, because you wouldn’t know where the viewer was. RH: There is one problem. I could be driving or Jeremy could be driving and the viewer could just look away and stare out of the window. But let’s see how it goes. Is there anything you miss about the ‘good old days’ of television? JM: Yes, there was always someone who came and sorted out the printer for us at the BBC. RH: Not really. Linear television is still around and it will be for the foreseeable future but SVOD is the way my daughter consumes television and it’s only heading in that way. JM: And it isn’t really a dividing line. We weren’t technically on linear television before because the iPlayer has been around for many years. JC: It is quite difficult explaining it all to old ladies, which I have had to do quite a lot. Them: “When’s your programme on?” Me: “It’s on now”. Them: “Oh, I better go home and watch it”. Me “No, that’s not how it works. Oh, forget it”. Finally, favourite car of the year? 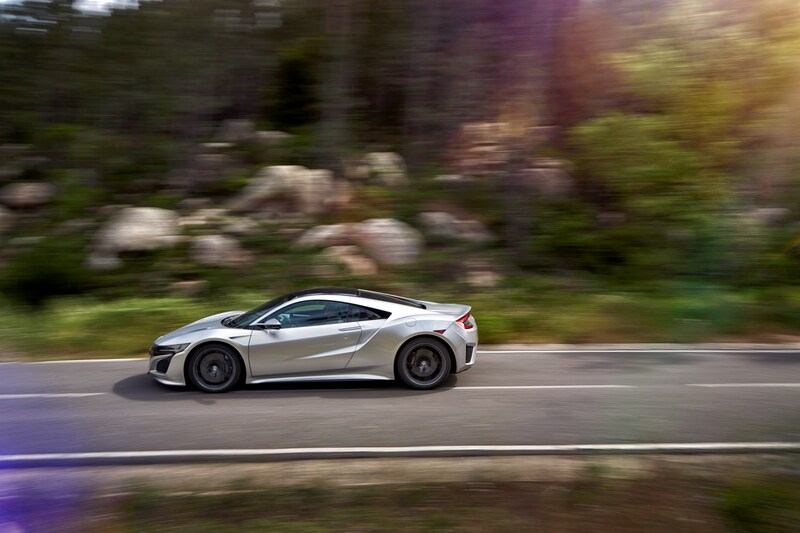 JM: Honda NSX for me. JC: Toss up for me, the DB11 and not for reasons everybody will think – just another pretty Aston – but it is genuinely amazing. It is more than a pretty face. But it’s just pipped by the Giulia QV for me. RH: Dodge Hellcat for me because I’m an idiot and it made laugh a lot. It’s the car I’ve most enjoyed driving this year. Have Clarkson, Hammond and May unleashed your tribal instincts? Make sure you join our tribe, Living Flat-Out now.